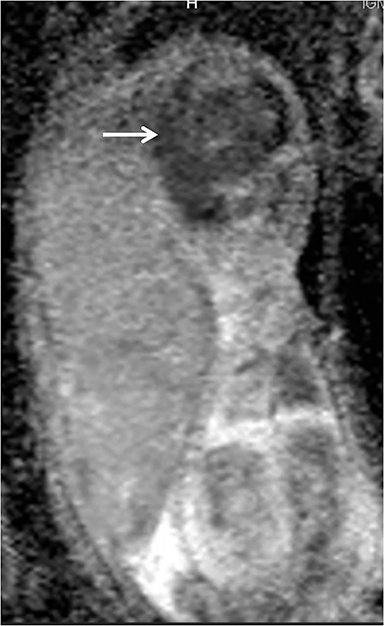 A 28-year-old, gravida 2, para 1 woman presented in her second trimester for routine sonographic evaluation. Her obstetrical history was unremarkable. The routine blood tests were normal. 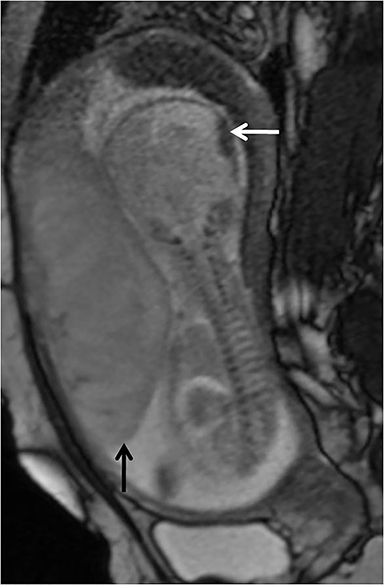 Sonography revealed a single fetus with normal growth parameters. However, there was placentomegaly with a thickness of 6.5cm and a large, thin-walled cyst on the placental fetal surface abutting the umbilical cord insertion. No solid component or blood flow was appreciable in the cyst. 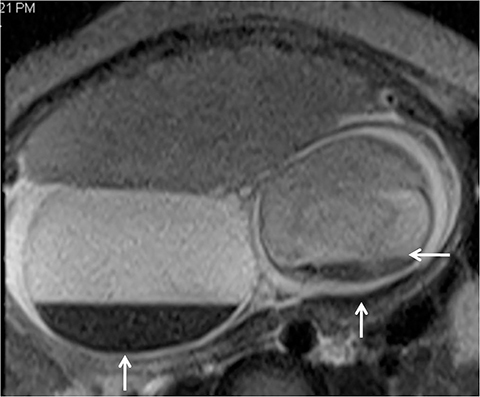 An MRI scan was performed after 2 days to evaluate the contents of the placental cyst; the images revealed fluid-fluid level suggestive of hemorrhage which was not seen in previous ultrasound imaging (Figure 1). The fetal head showed scalp edema and intracranial extra-axial hemorrhage (Figures 1 and 2) with diffusion restriction in fetal brain (Figures 3 and 4). Fluid-fluid level was also seen in the amniotic fluid (Figures 1 and 2). The patient aborted the dead fetus the following day. The amniotic fluid was blood stained. 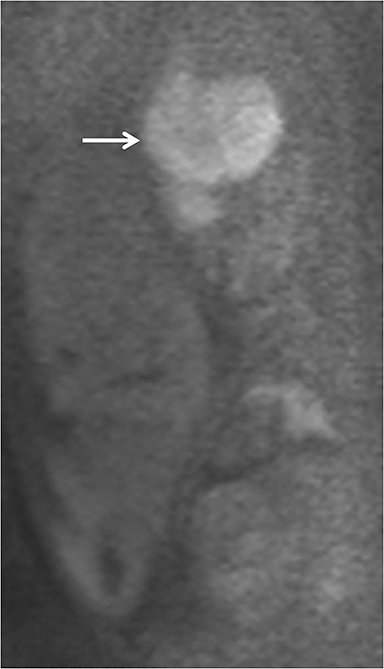 The placental cyst had ruptured and could not be delineated separately from partially necrosed placenta. Placental cysts near the cord insertion site should be monitored sonographically and any feature suggestive of fetal hypoxia warrants timely intervention. Raga F, Ballester MJ, Osborne NG, et al. Subchorionic placental cyst: A cause of fetal growth retardation-ultrasound and color-flow Doppler diagnosis and follow-up. J Natl Med Assoc.1996; 88:285-288. Elsayes KM, Trout AT, Friedkin AM, et al. Imaging of the placenta: A multimodality pictorial review. RadioGraphics. 2009; 29:1371–1391. Brown DL, DiSalvo DN, Frates MC, et al. Placental surface cysts detected on sonography histologic and clinical correlation. J Ultrasound Med. 2002;21:641–646. Radiological Case: Placental cyst. Appl Radiol. Prepared by Dr. Shruti Thakur, Dr. Jhobta, and Dr. Charu Smita Thakur while at the Department of Diagnostic Radiology, Indira Gandhi Medical College and Hospital, Shimla, Himachal Pradesh, India.